The All American Pressure Canner, originally produced by the Wisconsin Aluminum Foundry in 1930, remains as one of the best devices to use when canning foods. In addition to safely preparing foods for preservation, this canner is also capable of pressure-cooking beef and chicken into tender, juicy cuts in less time than it takes to bake them. Exclusive to this brand of pressure canner is something called a "metal to metal" sealing process that involves clamping locks tightly, sealing the cover without gaskets, making it easier to open and close the lid when necessary. It also means you never have to worry about replacing rubber gaskets. An All American Pressure Canner is capable of delivering the steep temperature (at least 240 degrees Fahrenheit) necessary to properly preserve low acid foods that have a pH level more than 4.6. This condition is produced by creating steam in a pressurized environment. 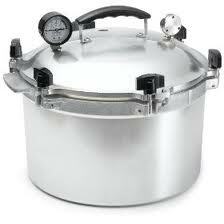 Pressure canning is the only method recommended by the USDA to can low acid foods without fear of spoilage. Low acid foods (dairy, red meats, poultry, fresh vegetables and some fruits) need high temperatures that cannot be reached by immersing jars in boiling water. A canning/cooking rack, recipe booklet and instruction manual come with each All American Pressure Canner so that even novices can preserve foods on the first attempt. Users should be aware that placing these canners on glass top ranges may result in breakage due to the weight of the canners. In addition, canner diameters exceed most range burner diameters so placing them on burners could cause heat damage to surrounding areas. Wisconsin Aluminum Foundry also sells home canning supplies such as fruit jell pectin, pickling supplies, canning jar rubber rings and various canning tools. This large capacity combination cooker/canner is constructed of heavy-duty cast aluminum and comes with strong screws that effectively seal the canner's lid for optimal performance without the use of plastic or rubber rings or gaskets. Capable of holding seven quart jars or 19 pint jars, the canner also has a regulator valve offering three different settings and a weighted pressure gauge to provide accurate readings. In addition, users also get an overpressure release to prevent unexpected accidents while canning. 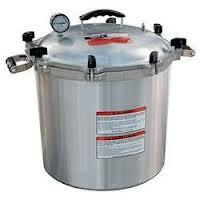 Price of the All American Pressure Canner 921 is around $300. All American manufactures an even larger appliance for serious home canners. Made from hand-cast aluminum, the 25-quart canner and cooker is equipped with a Bakelite “stay cool” top handle to help reduce skin burns and a metal to metal seal that eliminates the need for gaskets. Priced at $350, the 25-quart pressure canner and cooker has the following dimensions: a 16¾-inch overall height; bottom height of 12 inches and an inside diameter of 12¼ inches. For smaller canning jobs that need done quickly, All American provides this convenient canner that holds up to seven pint jars or four quarts. Purchase of this item also includes one free canning rack. Because of the reduced size of the 10½-quart canner, it only pressure processes pint-sized jars, while using the “hot water bath” technique for quart jars because they are too tall. Cost of this canner is $250. The National Center for Home Food Preservation offers a wealth of information for people who have purchased an All American Pressure Canner and want to begin preserving their own food for stocking and emergency supply purposes.